I had liked the Schopper Thorens 124 when I first heard it at Clive’s here, with the FR 64s and Zyx Uni II (I will soon be hearing it again with FR 64s and the AN IO Gold, and the Zyx Uni II with the Brinkmann 10 inch), and was also compared with a top Audiograil restore of the Garrard 301. Clive found this Garrard close to his Shindo 301 so sold off the Shindo. He also preferred it to his Brinkmann Lagrange and SME 30/2. Please read this before proceeding. 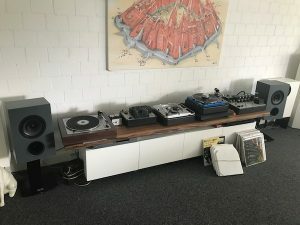 As a follow up, I visited Schopper in Zurich, Swissonor in Geneva, and Hanze Hifi in Zwolle, near Amsterdam. 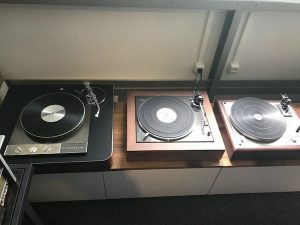 Swissonor made the parts for Schopper, Hanze hifi uses their parts and well-known engineer Jaap Pees does his own restores with these parts. 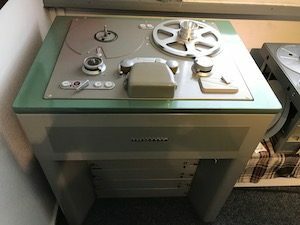 Jaap who restores and owns many vintage TTs including EMT 950, Denons etc. The TD 124 is his favorite, and he also preferes it to the EMT 927. 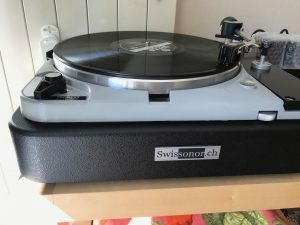 At Swissonor, I compared the Swissonor TA 10 to the SME 3009 on SPU a90. 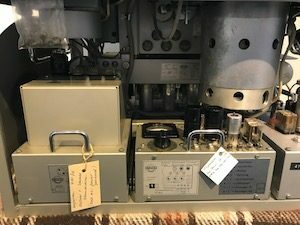 This arm was also recommended to me by well-known Italian dealer Dmitri as he had found it to be better than the Ikeda 407. Schopper does a similar arm himself. The carts on both turntables were the same, EMT TSD 15, but the 124 had the 10 inch EMT banana arm while the 401 had the 12 inch. The music just continued to flow. The 401 had a mid bass bump and a color I could identify, but that made the flow enjoyable. To focus on the midbass bump in an idler to me loses the point of why one actually enjoys it. Compared to the 124, the 401 had more fullness and room fill on softer passages, probably due to that bump. However, it was more laid back. The 124 was more cleaner, less colored if at all, had more air and space and wider stage, more detail and finesse, and better decay. The dynamics and slam and energy were off the charts. 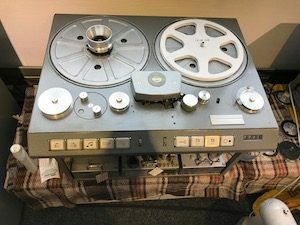 The PTP Lenco will have even larger drive and stage and bass, but I doubt it will have the details and the finesse of these restored 124s IMO. And since the 124s already have those qualities in spaded, losing out a little on them to the PTP will not mean anything because they will be well ahead of almost all other belts, and even DDs. Also, the PTP always room fills and sounds large, while the Schopper sounds large where it has to. Of course, many of you might google 124 vs Garrard and find opposite views, because people usually compare stock or self-restores. So do keep the Schopper or the Swissonor in mind. 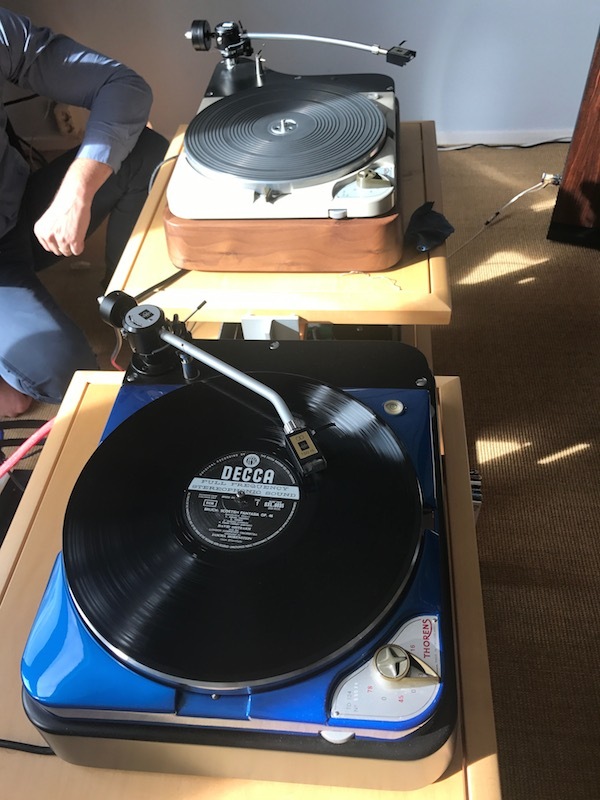 “Don’t have a Lenco but do have a Loricrafted 401 and a Schoppered Thorens in other words 2 fully restored turntables. 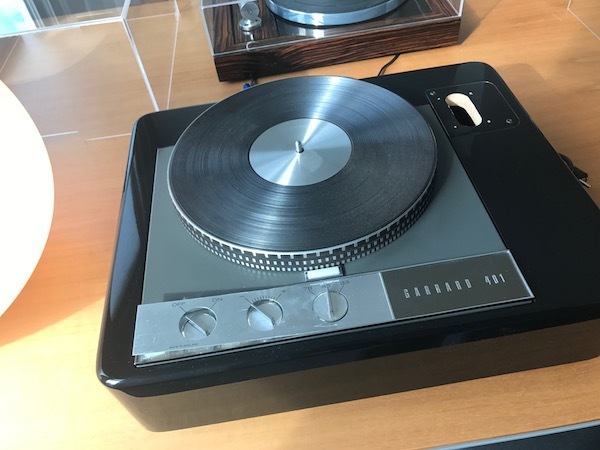 The Thorens 124 with its new bearing and platters has an amazing bass and midrange response and to my ears is superior in most respects to the Garrard…but a lot of money went into the restoration!! I felt I could listen to the Beethoven Emperor longer on the 401. Possibly the midbass bump was causing a fullness and a flow that was making it very relaxing to listen to this sort of music. The 124 was more explosive and better staged. On Scheherazade and especially Argenta Espana, it was a no contest – the 124 showed depth of the orchestra, details, top to bottom and open wide stage, as well as the energy on softer passages and louder dynamics in a fashion that made it an easy choice over the 401 as well as many of the other more expensive TTs I have recently heard, especially belt drives. The Garrard cannot hold complexity together as well, is more closed in, more laid back, and top end is more rolled off. That said, many different analog components are satisfying, and one can easily trade down in analog sonics and still be happy. I find Garrards one of the most joyous things to look at. 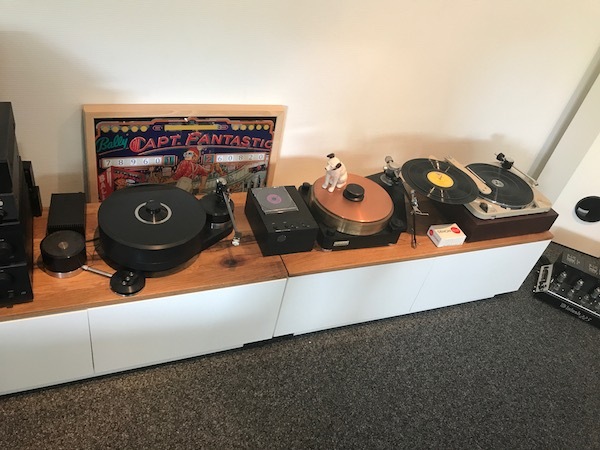 If you are ok to give up a bit on the sonic curve, I think Garrards in your choice of plinth are possibly one of the best buys in audio and impossible to switch off due to its musical flow. Something about it makes me want to keep it on, though I can see where it falls short. Now, this is the interesting part. I preferred the Garrard to the 124 in the wooden plinth, while I preferred the Blue colored 124 by far the best of the three and the above observations relate to the blue 124. There was a difference in the plinth. Both are costlier than the Garrard. The wooden one had less involvement and reduced stage, more flat. One of the first things that struck me as I entered Schopper’s demo room was the traded in Micro Seiki 5000 and the Brinkmann. 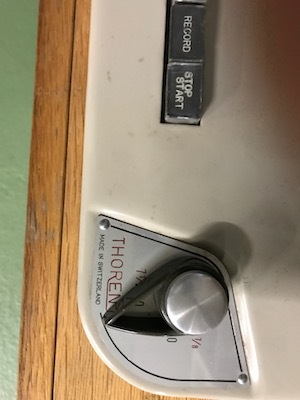 There were other restored vintage TTs. Schopper restores both the Thorens and Lenco – the Lenco is much lower priced with the arm, quite a steal for budget customers, at 1500 Eur. I cannot say how it compares to PTP Lenco. 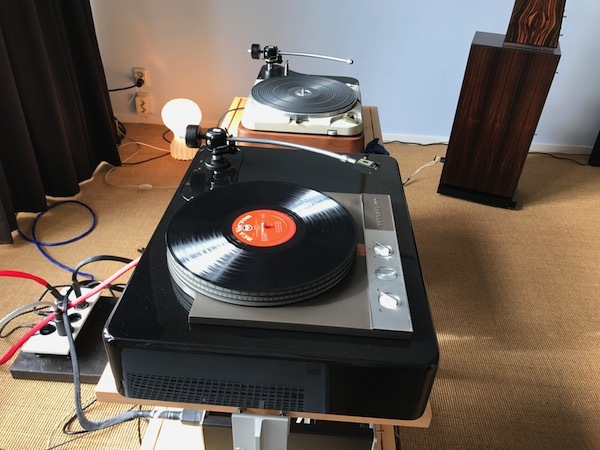 He also restores various TD125 and other models, but his premium seller is the 124, which he rates as by far the best of all Thorens models. Comparing the Lenco to the 124, the Lenco was larger, more aggressive. But the 124 was dynamic and large enough, and had more musical details and sustain and decay on each note. 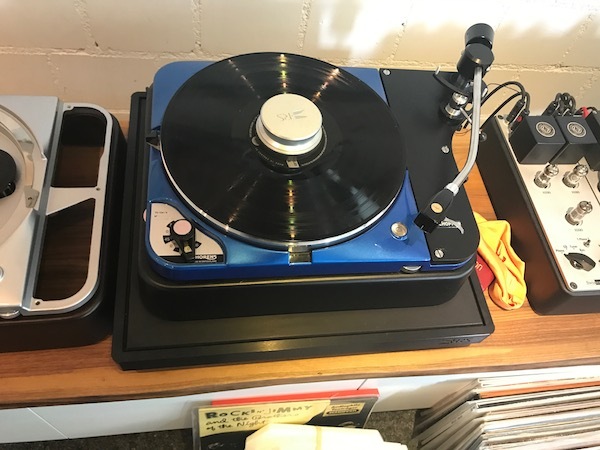 The 124 had a better arm and SPU a95, while the Lenco had the Ortofon blue quintet. Not exactly a style of speaker I am familiar with, so cannot judge overall sound from speakers. Oh yes, if you thought it was only TTs, he also restores tape decks. He also had a rare Telefunken m10a, and a Studer c37 and an 880. Then we moved to the power supply for the TT, which we ABed a few times with and without. The power supply brings it down to almost 200v, and he has found it performs better this way, as that was the voltage these TTs were designed to operate at. If you subject them to today’s 230 – 250v, some parts in them can run faster. ABing it back and forth a few times showed that with was more open, the soundstage coming out, with more air, as compared to without. 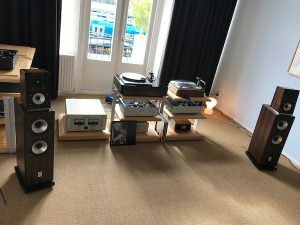 I also compared the power supply at Hanze hifi, and had similar results. Without the power supply there is more noise on complex stuff. Swissonor also makes his own. Urs of Swissonor does supply many parts to Hanze, and also to Schopper, as well as restores his own TD 124. Since there wasn’t a compare of TTs possible, I won’t be able to write specifically about attributes, but suffice to say that the TT looked and sounded very similar to the other restored ones. All of Schopper, Swissonor, and Hanze have their own power supplies. 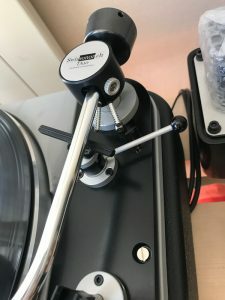 Swissonor and Schopper also make their own tonearms. I was able to compare the 10 inch arm at Swissonor (costing 3600 Eur) to the original SME 3009 that came with the original armboard on the 124, with Ortofon SPU a95. Gian too owns this arm, which his dealer Dmitri from Milan found to be much superior to the Ikeda 407. Compared to the SME, the Swissonor was much quieter, more authority, control, musicality, more rounded tones, and better midbass and bass. The SME had a bot more air, but especially on complex orchestral the SME held it more together. Overall, these restored 124s are my choice of the vintage idlers, and I would prefer them to many modern belt drives. As you can see above, SME 30/2, TW Raven AC3, Brinkmann Lagrange, and Micro Seiki 5000 have been replaced by these. Another had the Feickert Blackbird and the STS 124 from Greg Meltz in the US, and ended up keeping the 124 and selling the Feickert. So do put them in your consideration not only at the prices they sell at, but they do punch above their weight. 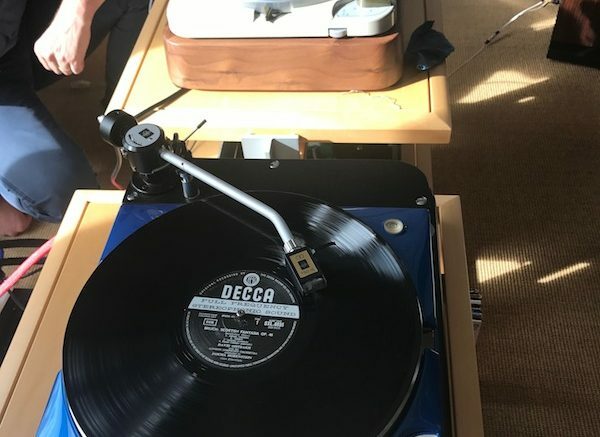 Be the first to comment on "More on restored Thorens 124"